A new dress has been done. I sewed this very casual pretty dress, in polyester georgette and contrasting cotton/silk blend, using a pattern called "Leia" from TAMANEGI-KOBO. It was an easy sewing, except the front yoke. The seam above chest is winding as you can see in the technical drawing below, and it needed a bit of help with glues and hemming tapes to get it done neatly. Basically, I glued the yoke and the bodice using a common stick glue (the type that is used for paper and is water soluble, but not the type that is called "fabric glue/adhesive" for hand craft) but didn't do traditional basting at all this time. I pasted those parts with glue as they should be placed, and then sewed the winding seam without any basting pin. My glues! 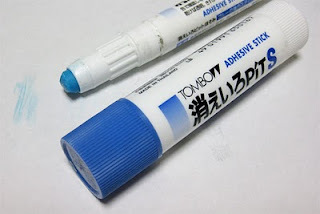 The blue color turns into clear and invisible as it dries, very convenient! I can't say whether your stick type glue would work exactly same as mine or not, but if you can be relatively sure that it doesn't seem to cause stains on your fabric, I'd recommend you once to check if it is usable for your sewing (onto fabric). I confess that I love pasting fabrics! I use pins, threads, laundry pegs, iron-on hemming tapes and stick glues for basting. If I needed to sew very correctly at very difficult corner on very slippery fabrics and also if I knew I was going to wash the garment in water anyway, I'd definitely paste them with hemming tape or glue as a basting. I use them in easier cases too. Since the pasted seam allowances can not be practically opened after stitching, I have to spend a second to think if it is alright with those seams kept closed, though. After introducing adhesive bastings and PDF patterns to my sewing, the scene of my hobby is very similar to the one in kid's Arts and Crafts classroom, with pens, scissors, glues, papers, tapes, cutters, hammers, tweezers, etc., and I've been amused by that. Me at sewing looks very unprofessional. But who cares? I think this dress has quite a use. Very casual and relaxed in a good way. This is a lovely dress and such a nice design. Yes, I agree. A very cute dress! I would never have thought of using glue when sewing, but I love the idea ! Your dress is lovely, by the way. Very cute dress! I love your out of the box thinking to use glue. I'm assuming that any glue washes out, as it's water soluable. Clever girl! Adorable dress! I'm doing some business in Hawaii right now and love your shoes - I may look for some shoes like that! Great dress! Great fabric - it makes the dress! Lovely dress! I've started using glue only recently, particularly when basting zippers, it's been quite a revelation! The result you got with your yoke makes me want to use it even more! 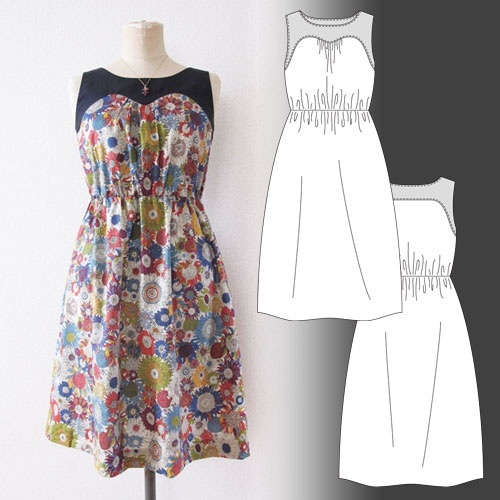 Cute dress, I love the shape of the yoke, very nice! Your dress is so cute. I've just gone through several of your past posts, and I love your blog. So I am signing up as a follower and adding you to my blog list. I hope you'll come by and look around my blog, too, when you get a chance. I'll be looking forward to your future posts. I just bought the macaron pattern, but this actually looks like a version of it that I could make while pregnant! That fabric is DIVINE. A gorgeous dress!